May help support mood and sleep. 5-Hydroxytryptophan (5-HTP) is a natural compound found in every living cell. It is involved in biochemical reactions throughout the body, especially in the manufacturing of neurotransmitters in the brain. 5-Hydroxytryp¬tophan is converted into serotonin in the body, which may help elevate mood, assist in controlling hunger and promote restful sleep. 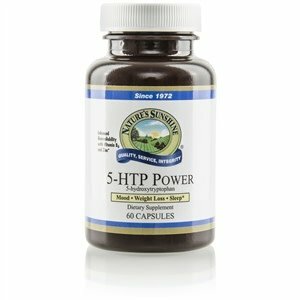 5-HTP Power blends three herbs traditionally used as adaptogenics—eleuthero, ashwaganda and suma—with 5-HTP to help the body adjust to changes.. It also contains vitamin B6 and zinc, which support the action of 5-HTP. Vitamin B6, zinc, 5-HTP, eleu¬thero root, ashwagandha root and suma bark. Take one capsule with a meal three times daily. The 35 mg of 5-HTP in this product allows flexibility when adjusting serving size.